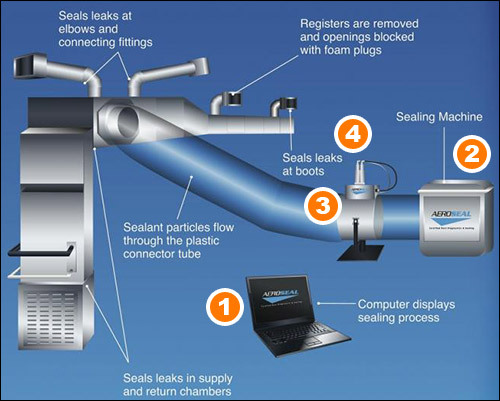 Aeroseal’s aerosol ductwork sealing technology was invented and developed by the Energy Performance of Buildings Group at Lawrence Berkeley National Laboratory in 1994. This technology internally seals duct leaks in air distribution ducts by injecting a fog of aerosolized sealant particles into a pressurized duct system. The key to the technology is to keep the particles suspended within the air stream without depositing on the duct surfaces until they reach the leaks, where they leave the air stream, deposit at the leak edges, and seal the leaks. Our Patented Machine is made up of the following components. Each component is essential to the Aeroseal process.